Just when I thought Streetscapes had been abandoned by outdoor advertisers in NYC, or at least in Chelsea, a new one shows up right in the hood. Now I like Rupaul just the same as the next guy but I don't want to indulge her, and her gender bending buddies, first thing in the morning at 15 feet tall. Having grown up in Chelsea I can enjoy a beautiful man like the next, but let's keep it legal people. This is an Environmental Control Board (ECB) Violation. The Department of Buildings has been contacted, please remove this abomination IMMEDIATELY, this is not Times Square. I obviously called this "abomination" in as well given that the recent equinox billboard removal in Greenwich Village came after huge public outcry made it a newsworthy issue. When I went to check complaint # 1274098 that I made at 9:00am this morning there was already a 3rd complaint filed by another party. I find it interesting that this concerned New Yorker complains "this is not Times Square". Many New Yorkers you talk to have no problem with the theme park being run in midtown. In fact many New Yorkers rarely pass through that part of town unless out of necessity. As is evidenced in this public response, this does not mean New Yorkers want to live in Times Square. Although New York, and particularly Manhattan, feels less like somewhere we live and more like somewhere the world visits, this is simply not the case. Our neighborhoods and communities are just that. Using them as sites of commercial interruption, especially when done illegally, harms the people that live in this city and the sense of control over their environment that is needed to feel invested in ones community. Streetscapes like this and the others we have kept track of are particularly insulting because of their scale and placement which is meant to overwhelm the viewer. 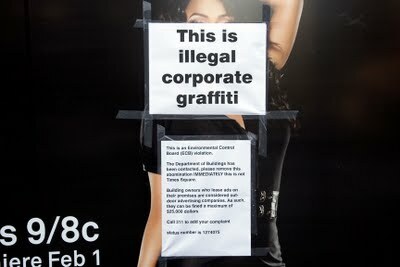 I also find it interesting that this resident makes the comparison between advertising and traditional graffiti. 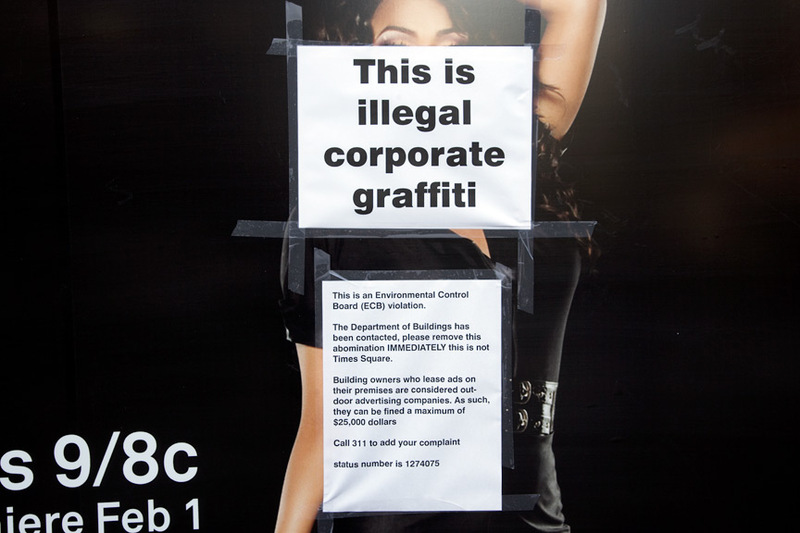 When outdoor advertising is illegal, you can often find this comment being made. I am inclined to disagree slightly because it would seem graffiti artists often become incredibly productive parts of our society working in design, the arts, and ironically advertising, as well as many other fields. People who hang advertising and particularly illegal postings like this, continue a long and drawn out career of violating our streets in new and more insidious ways. This says nothing about the fact that graffiti or marking ones environment as a way to find ones identity in a city of 8 million people, might actually be a important avenue of expression for our youth. I have added this location to our Streetscape map where you can find more illegal ads posted by companies like InWindow and Blue Outdoor. We will report back when this Streetscape is removed.